A snowcat rests next to a drift of snow measuring more than eight-feet in height. 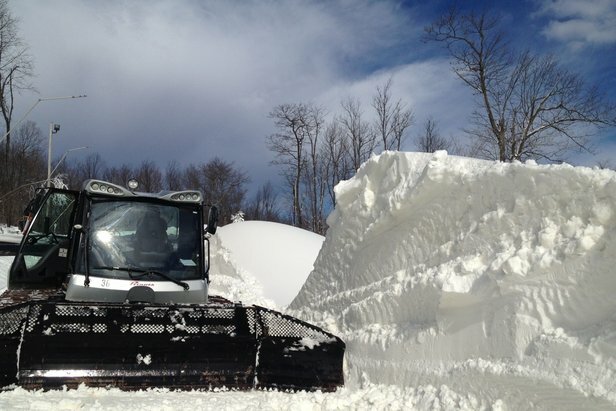 SEVEN SPRINGS, Pa.– Seven Springs Mountain Resort and Hidden Valley Resort will open for skiing and snowboarding Fri., Nov. 29, 2013! Initial snowmaking began Tues., Nov. 19, and resumed around the clock Saturday evening through Monday morning. After a weekend of intense snowmaking, both resorts have an average snow base of 8-26 inches and plan to resume snowmaking Tuesday night through Wednesday night, weather permitting. Seven Springs andHiddenValleywill be open 9 a.m.-5 p.m., Fri., Nov. 29-Sun., Dec. 1, 2013. Hours of operations for dates beyond Dec. 1, will be available later this week. Seven Springs will offer at least eight slopes and trails and the Santa’s Beard and Arctic Blast terrain parks with at least eighteen features all serviced by two to three chairlifts and one surface lift. Seven Springs ski and snowboard tickets will be $51 per adult and $48 per child ages 6-11 and will be valid 9 a.m.-5 p.m. Midweek season passes will also be valid this weekend. Skiers and snowboarders atHiddenValleywill have six to eight slopes and trails and one terrain park, serviced by two to three chairlifts and one to two surface lifts. Hidden Valley ski and snowboard tickets will be $28 per adult and $25 per child ages 6-11 and will be valid 9 a.m.-5 p.m. Midweek season passes will also be valid this weekend. For all the details pertaining to snowmaking, snowfall totals and available terrain, please check the snow report online at www.7springs.com or www.hiddenvalleyresort.com. Seven Springs Mountain Resort, located inSeven Springs,Pa., is the perfect place for family vacations that create lifelong memories. Each year the family-friendly resort hosts more than one million overnight and day guests. Seven Springs has 33 slopes and trails on 285 skiable acres, seven terrain parks, the region’s largest snow tubing park, an 18-hole golf course and 60,000 square-feet of meeting and convention space. Located within 200 miles of the major metropolitan areas ofPittsburgh,Baltimore,ClevelandandWashingtonD.C., Seven Springs is easily accessible from either exit 91 or 110 of the Pennsylvania Turnpike. For more information on Seven Springs and the year-round lodging, dining and activity options the resort offers visit www.7springs.com or call (800) 452-2223. Hidden Valley Resort, located inHidden Valley,Pa., is the ideal winter destination for families. With 31 slopes and trails and three terrain parks on 110 skiable acres and a first-class snowsports school,HiddenValleyoffers a comfortable environment to learn to ski or snowboard. Located within 200 miles of the major metropolitan areas of Pittsburgh,Baltimore,ClevelandandWashingtonD.C.,HiddenValleyis easily accessible from either exit 91 or 110 of the Pennsylvania Turnpike. For more information about HiddenValley, visit www.hiddenvalleyresort.com or call (814) 443-8000.